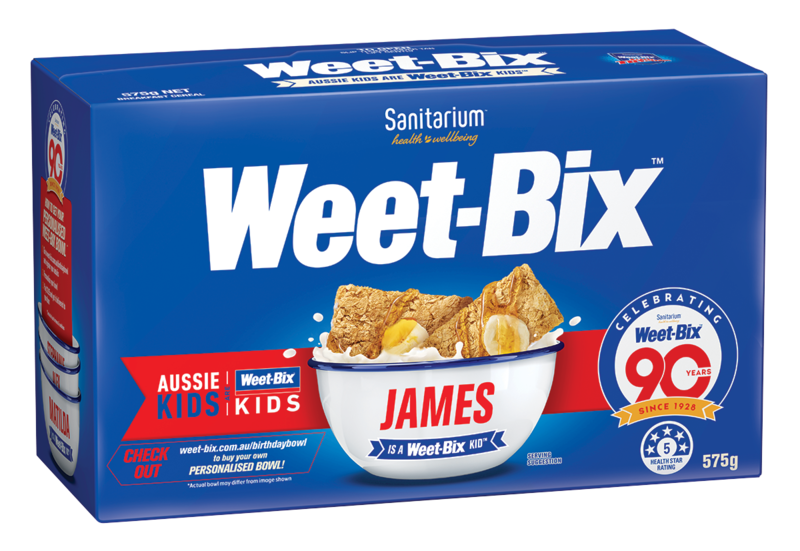 This year Sanitarium Weet-Bix via The Mix Agency, Shopitize and The Kanga Group, is celebrating 90 years of Australian breakfasts. Sanitarium is celebrating by inviting Aussie kids (young and young-at-heart) to help them celebrate with the release of limited edition birthday packs and personalised Weet-Bix bowls. 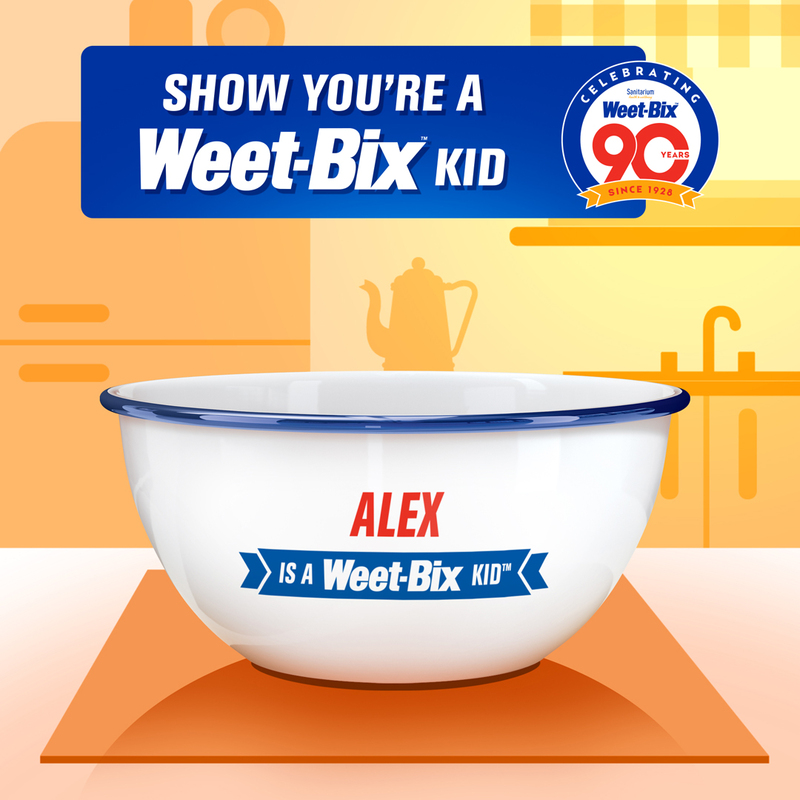 From Kalgoorlie to Kiama, Bowen to Broome and Darwin to Devonport, Aussie kids have always been proud to call themselves Weet-Bix kids, wearing the title like a badge of honour – a quintessential expression of what it means to be Aussie. While the 1985 ‘Aussie kids are Weet-Bix kids’ jingle is forever etched on our nation’s psyche, phrases like ‘Hope he’s had his Weet-Bix’, ‘Breakfast of champions’ and ‘How many do you do?’ have also stood the test of time. While the original Weet-Bix recipe has remained largely unchanged, the way Australians consume has had a modern day makeover and no two family members or friends go about it quite the same way. These days alongside the classic ‘drowned in milk’ approach, Aussies love piling them high with fruits, nuts and seeds, smashing them into smoothies, smothering them with spreads and even dipping them in yoghurt. Served hot or cold – good either way. But of course the age-old battle lines remain drawn – do you do them crunchy or soggy? That was the insight behind the new campaign that invites Australians to join the Weet-Bix 90th birthday celebrations. No two Weet-Bix eaters are the same, so why should their bowls be? 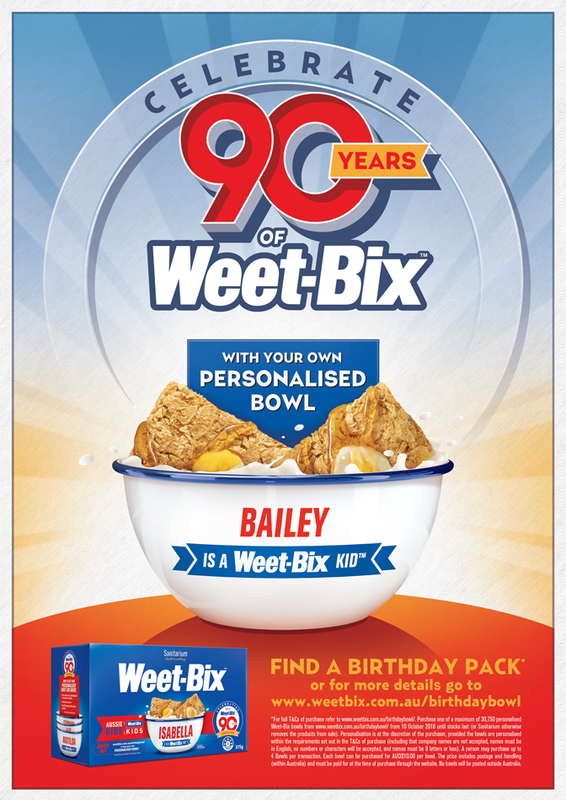 To celebrate the 90 year milestone and create in store theatre and excitement, Sanitarium has released a limited edition collection of Weet-Bix birthday packs, featuring 58 of today’s most popular names. From Zoe and Sam, to Ruby and Oliver, Mum and Dad, and even Nan and Pop, the distinctive birthday boxes can now be found on supermarket shelves throughout the country until late November or until stock runs out. But the fun doesn’t stop there, as Weet-Bix senior brand manager Alex Garas explains. “Few brands enjoy the relationship with generations of Australian families like we do – the Weet-Bix brand is in almost half of all Australian homes. “We’ve always been about simple goodness – wholesome nutrition that the whole family can enjoy. And for 90 years we’ve been right there with them at breakfast. “It’s a real privilege so we wanted to do something extra special to say thank you – thank you for trusting us with getting your family off to a great start every morning. Garas add this is no ordinary breakfast bowl: “We share the frustration of Weet-Bix fans who have to break their ‘bix’ to fit them into standard cereal bowls. “Our birthday bowl will give our fans plenty of room to respond in signature style when someone next asks ‘How do you do yours?’” he said. The Mix Agency strategy director Shannee Wee said: “We wanted to not only help Weet-Bix celebrate a milestone but also to reward consumers with something that would play a functional role in their daily routine. “What better way to start the day than a couple or more “bix” in your very own bowl. “We felt the concept of a personalised bowl was not only synonymous with breakfast and the brand but also something that every Mum would want to collect for her whole family, while still being relevant to young adults who grew up with the brand. “It was fantastic to collaborate with our agency partners to bring to life this campaign for Weet-Bix,” Wee added. The campaign will be supported by an integrated retailer shopper marketing and brand owned digital and social campaign as well as PR.